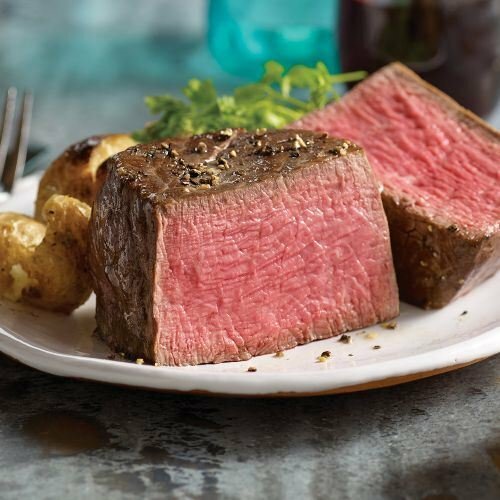 Four each of three renowned Omaha Steaks popular cuts. Experience the unique taste and texture of each of these customer favorites. All hand carved from superb grain-fed beef, they're slow-aged to the peak of perfection and flash frozen to suspend that goodness until it's released when you place that steak on your grill. From the exquisite tender and elegantly mild Filet Mignon to the firmer bite and bold, beefy Top Sirloin flavor to the Bacon Wrapped Tri Tip Steaks. Find your favorite... or like most of us, love them all while they're on sale! INGREDIENTS: Beef; Beef; Beef, Bacon cured with: water, salt, sugar, sodium phosphate, sodium erythorbate, sodium nitrite.